1. Star Trek: The Experience, a must see for any Trekker, but fun for anyone who enjoys Sci-Fi or pop culture. You can even get married there. 2. Big Shot, the best view of Las Vegas you can get at 4G. The original and still best ride atop the Stratosphere Hotel but Insanity is a close second. 3. The Sirens of TI, the sexier version of Treasure Island’s free sidewalk show but still my favourite. How can you not enjoy a show that sinks a galleon five times a night. Arrive early to secure a good seat. 4. Bouchon, Las Vegas, Thomas Keller has brought his French Bistro experience to Vegas. Go beyond the buffet, and experience Keller’s innovative menu. 5. An Elvis theme wedding at the Graceland Chapel is the most fun I’ve had in Vegas, and my friends (it was their wedding) have almost worn out the DVD sharing our experience. 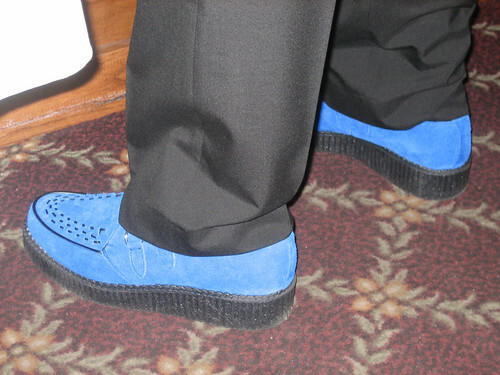 Wear your blue suede shoes.